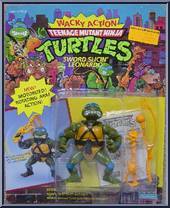 Wind-up streetwise reptile with breakfightin' action! 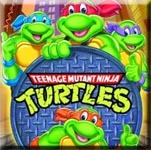 Vital Tortistics: Accessories: Garbage can gyro-lid with Turtle tools, rat bola, and anti-Foot stars! 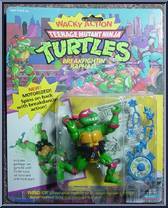 When Raphael gets wound up, he likes to u. . .
Wind-up rat with sewer slitherin' action! VITAL RATISTICS: Accessories: Tail Totin' Accessories, Ninja Knife, Rat Lantern Action Feature: Crawlin' and Slitherin' Action! Slitherin' through the s. . . 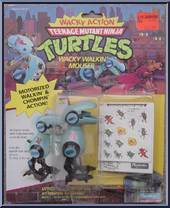 The wind-up wart hog with headspinnin' action! VITAL BOPTISTICS: Accessories: Psycho Sickle, Spiked Skull Ball and Survival Belt! Action Feature: Headspinnin' Action! When Bebop gets all wound u. . . The wind-up rhino with rapid recoilin' arm action! VITAL ROCKTISTICS: Accessories: Terrifying Tusk Gun, Pulverizing Pistol, Boxing Skull Glove and Survival Belt! Action Feature: Rapid Recoilin' Ar. . . The party reptile with twist-wrist Ninja action! 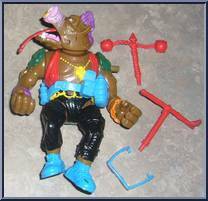 VITAL TORTISTICS: Action Feature: Twist-wrist right forearm with sewer snakes, swiss-army sewer cover and nunchukus (sa tjat koen) It's rock 'n roll,. 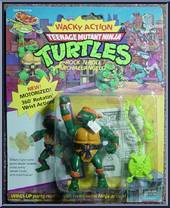 . .
Wind-up sewer spyin' reptile with swimmin' action! 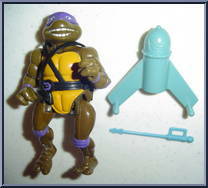 VITAL TORTISTICS: Accessories: Floating sewer-scuba sewer jet and detachable Foot seeking spear Clean up the stinky Foot with Sewer-Swimmin' Donate. . . The wind-up madman with spinnin' slice 'n dice blades! 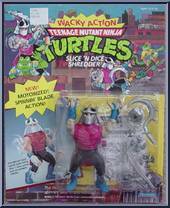 VITAL SHREDTISTICS: Accessories: Serrated Sword, Sicko Sickle, Slice 'n Dice Armor & Detachable Blades Action Feature: Spinning Blade Act. 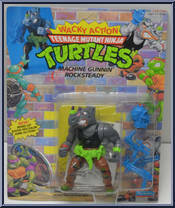 . .
Wind-up radical reptile with slash 'n thrash action VITAL TORTISTICS: Accessories: Wacky Whip, Silly Sword, Menacing Mace Action Feature: Slash 'n thrash rotating right arm Foot Soliders. Nobody. . .
Robotic rat trap with an appetite for Turtles! 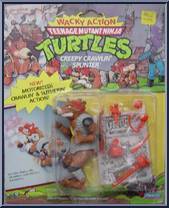 VITAL MOUSERTISTICS: Action Features: Repulsive chomping jaws, real walking action, punch-out card of rats, Turtles 'n things! Birthplace: Baxter Stockm. . .